Posted 24 February 2014 & filed under 1960s, 1970s, Life and leisure, Pubs and clubs, Rob Edwards. Rob Edwards was a member of the Cottonmill Club which used to be near where the Marlborough Pavilion is today. It was a large building with a dance hall and a bar and it was open seven days a week. He recalls listening to local bands there. At that time, the club was thriving having two football teams, a top darts team. and residents played dominoes and cribbage. There was always something going on. Residents got it built and there was a sense of real community spirit. Rob can remember the King Offa public house being built as he and his brother used to nick the building sand for a sandpit in their garden. It was never as popular as the Cottonmill Club or other pubs in the town. 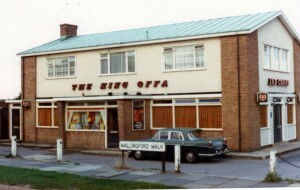 Rob used to go to the King Offa to play on their darts team. I expect you knew my Great Uncle, Charlie Payne? 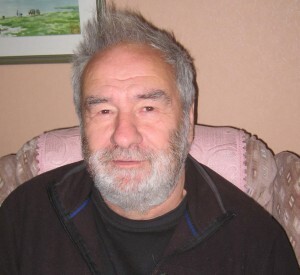 I knew Charlie very well, he was also a friend of my father who would take Charlie and other pensioners into town to collect their pension and then out to the John Bunyan for a lunch time drink. I remember celebrating Charlie’s 90th birthday with him in the King Offa. In the photo of the Offer I think the car could well have been my Austin Westminster, registration HOF ??? I was the guitarist in The Matchmakers in the early 80’s. Do you know Ron and Mary or have any photos or anything from those days Rob? Chris..Yes I know Ron Tuck and Mary Tuck (Bushby) I am freinds with Mary’s son Dave who I have known since school. They used to live in Berners Drive and moved to Ennerdale Close on the Mile house estate. Thanks so much for replying Rob , are Ron and Mary both still alive? I would love to have their contact details and be able to speak to them.. I don’t have any photos or anything from the Matchmaker days and would love to see if they have any. Hi Chris…. I am afraid not, but I will speak to Dave and get their address for you.